Belau Air (www.underwatercolours.com/belauair), Palau's domestic airline, flies between Koror and Peleliu and Angaur. 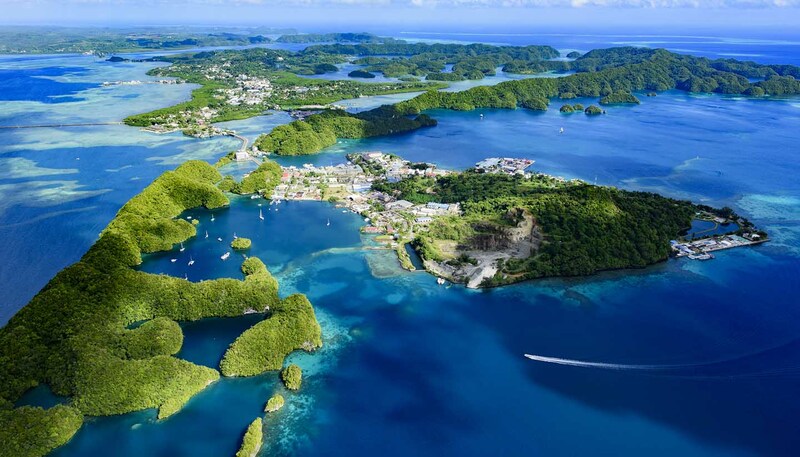 In addition, Palau Helicopters (www.palauhelicopters.com) offers scenic flights over the rock islands. The vast majority of Palau's islands are unpaved and most don't have any road infrastructure at all. The main island of Koror has paved roads which are well-maintained, while the majority of Babeldaob Island (which is accessed via a road bridge from Koror) has less well-maintained roads which are best accessed by 4-wheel drive vehicles. The airport is located in the southern part of Babeldaob in Airai and has good quality road and public transport connections with Koror. Almost all dive centres, hotels and resorts offer shuttle services to and from the airport. Most dive centres also arrange morning and afternoon pick-ups from hotels and guest houses, meaning car hire isn't always necessary. Despite driving on the right, most cars are left-hand drive as they are imported from Japan, which can be slightly confusing for visitors renting a car. Koror's diminutive size and few roads however means they are easily and safely navigable. The road network is extended beyond the paved roads of Koror to Babeldaob Island with many coral and dirt roads connecting to other states such as Meyungs. There is one main road through Koror and despite its small size of 14km (9 miles) in length, it does get congested during rush hour. The majority of Babeldaob's main circular road is in fairly good condition, although side roads can be less well maintained. There are few pavements, so pedestrians should take care. All of Palau's roads are single-lane carriageways. You can hire cars from the airport upon arrival and there are several local companies to choose from, as well as the international Budget Car Rental. Drivers must be at least 21 years of age. There are many taxis in Koror offering comfortable travel. They are not metered and fares are fixed (drivers carry a rate sheet which you can ask to see). It's common to hire the services of a particular taxi driver for the duration of your stay and simply call them each time you need a lift. Restaurants, hotels and activity centres will happily call a taxi for you. You can rent bikes from a cycle-hire centre in Koror for a day or longer. It offers well-maintained mountain bikes, which are ideal for visiting Babeldaob. The maximum speed limit is 40kph (25mph) and it is illegal to overtake slow-moving cars (although this does happen). Due to Palau’s small size and its navigable roads, a breakdown doesn’t have to be disastrous. If you encounter a breakdown in a hire vehicle, simply telephone the car hire company and they will arrange for assistance. Drivers are permitted to drive in Palau on an International Driving Permit for 30 days, after which they must apply for a Palauan licence. Koror is the main town, and due to its small size it's easy to get around on foot. Alternatively, taxis are widely available. Palau's islands are its main attraction, and there are dozens of tour operators offering trips to the rock islands and between the main islands of Palau. Unscheduled inter-island boat services are available to Babeldaob and Kayangel and it's possible to hitch a ride with one of the local boats heading out to the islands. Several tour operators also offer private day charter of boats.